Christmas is a time of being given to and giving. I just watched a news clip where the Make a Wish Foundation turned a school gym into Whoville and granted a little boy who suffers from brain injury and pulmonary problems. Shopping with a Cop has been in our local newspaper lately. On Wednesday night December 6th members of the church we attend in Richmond Michigan 27 miles away 8 members of the church drove the 27 plus miles to our home for our Wednesday Night Bible Discussion and Worship Service. Being freely given and freely give goes far beyond the month of December extending out into 365/24/7. This maybe rather hard to understand, but let your mind drift back across the years and try to imagine what your life/living would have been like had God withheld even the smallest Blessing. Our life/living may look like a giant jigsaw puzzle, but to God it’s a beautiful tapestry of ups and downs, ins and outs, around and arounds all with one purpose to share not only a relationship with Him, but with each other too. When I was a child, I thought like a child, gimme, gimme, gimme. But now as a certified adult (sometimes) it’s give, give, give. There are times when I think I can’t give any more because the principle of “we can’t give with an empty tank” is a haunting reality. However, just as I realize I am “giving on fumes” God comes along or sends someone (like members of a distant congregation) and gurgle, gurgle, gurgle my tank is filled! 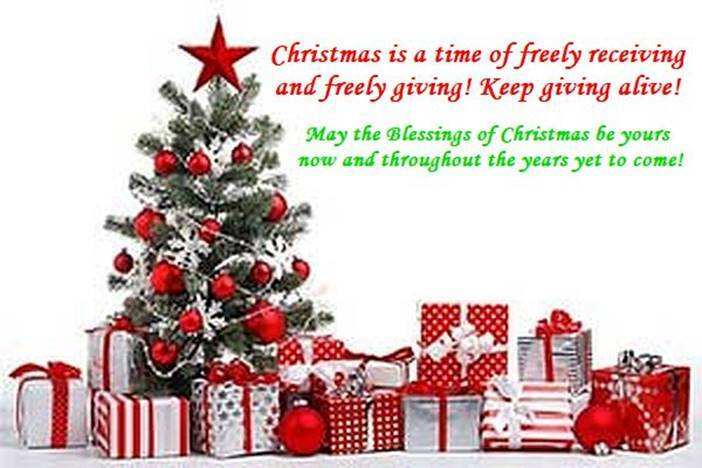 Christmas is a time of freely receiving and freely giving! Keep giving alive! May the Blessings of Christmas be yours now and throughout the years yet to come! Scripture quotations marked NLT are taken from the Holy Bible, New Living Translation, copyright © 1996. Used by permission of Tyndale House Publishers, Inc., Wheaton, Illinois 60189. All rights reserved.